The issue of land reclamation should be tackled in a responsible manner. The Netherlands used land reclamation successfully to adequately manage its low-lying land. Hong Kong made use of land reclamation to create high value land required for its airport on the Chek Lak Kok island. Through land reclamation Singapore expanded its container port, an essential cornerstone in its economy. In Malta land reclamation was used in the past to create the Freeport Terminal at Kalafrana in the limits of Birżebbuġa. MEPA has during the recent past engaged consultants to assess the potential of land reclamation in Maltese waters. A 2005 study was commissioned by MEPA and carried out by Carl Bro. This study identified six relatively large coastal areas as search areas for potential land reclamation sites. The study had recommended that these six areas, or a selection of them, be “investigated in further details in parallel with the execution of a pre-feasibility study, before a principal decision is taken on whether land reclamation is considered realistic under Maltese conditions. It is recommended that such investigations and studies be carried out by the Government prior to the involvement of the private sector in possible land reclamation projects.” (page 8 of report). MEPA took up this proposal and commissioned ADI Associates together with Scott Wilson to carry out a detailed study on two of the identified coastal areas. These studies were finalised in 2007 and 2008 and consist of 4 volumes. The coastal areas identified and studied are those along the Magħtab/Baħar iċ-Ċagħaq coastline and the Xgħajra/Marsaskala coastline. These latter studies conclude with a detailed set of recommendations on more focused studies relative to environmental and economic impacts which would be necessary if land reclamation is to be further considered. In Chapter 10 of its electoral manifesto the Labour Party is committed to utilise a programme of land reclamation as an important tool in the infrastructural development of the country. The said electoral programme emphasises the environmental and economic sensitivity of such projects and underlines a commitment to high standards in environmental, social, economic, land use planning and sustainable development fields. In Parliament it has been declared that the next step would be for expressions of interest to be submitted by those proposing projects for development on reclaimed land. A call should be issued in the near future. I believe that this is not the way forward. On the basis of the studies carried out to date and such additional studies as may be required it would have been much better if government presents for public consultation a detailed draft land reclamation strategy. Such a strategy would then be subjected to public consultation. A dialogue is required, not just with the developers but also with civil society, including most importantly with environmental NGOs. The draft strategy would undoubtedly indicate the proposed permissible development on the reclaimed land. It would be interesting to note if the said strategy would consider the need for residential development in view of the over 70,000 vacant residential properties on the islands. On the basis of existing and possibly additional studies the strategy would also seek to ensure that Malta’s coastline is protected much more effectively than Malta’s countryside has been to date. All views should be carefully considered before such a strategy is finalised. Once the strategy is finalised its environmental impacts should be carefully scrutinised as is provided for in the Strategic Environment Assessment Directive of the EU. This Directive now has the force of law in Malta. It is only when this assessment has been finalised and the impacts identified are suitably addressed through changes in the draft strategy itself (if required) that it would be reasonable to invite expressions of interest from interested parties. 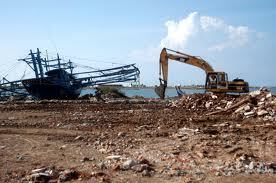 Land reclamation is no magic solution to a construction industry which is in urgent need of restructuring. Even if land reclamation is permitted it cannot and will not offer a long term solution to an ailing construction industry which has been capable of contributing to an accumulating stockpile of vacant dwellings which are equivalent to 9 ghost towns, each the size of B’Kara. The country would be economically and socially much better off if the construction industry is assisted in its much needed restructuring. It would undoubtedly need to shed labour which can be absorbed by other sectors of the economy. Retraining would be required to ease the entry of the shed labour force into other economic areas. This would certainly be much more beneficial and sustainable than land reclamation.